GOP's midterm one-two punch: Keep Trump on the trail, Senate Dems in D.C. The president is expected to make roughly one campaign trip a week, as the Senate Majority Leader fills the calendar with votes on his judicial nominees. WASHINGTON — Republicans are coalescing around a two-theater plan of political attack to save their Senate majority: keep President Donald Trump barnstorming the trail for GOP candidates while Senate Majority Leader Mitch McConnell, R-Ky., keeps Democratic incumbents off it for floor votes in Washington. McConnell is threatening to cancel all or part of the annual August recess to focus on trying to confirm Trump's nominees, and sources close to and inside the White House who spoke to NBC News on the condition of anonymity said that they are optimistic he will follow through on that course. The challenge for Republicans is that there is no clear path forward on any major legislation at a time when Trump will be trying to rally base voters in a series of states where Republicans are defending their own seats and trying to knock Democrats out of theirs. Paul Ryan says Trump a midterm asset, but is he right? The solution GOP leaders have been moving toward on parallel tracks is to put Trump on the campaign trail early and with more consistency than his predecessors while McConnell forces Democrats to choose between quickly confirming a spate of his nominees or spending valuable campaign time in Washington. "Is that a win-win? Looks like one to me," said Josh Holmes, a former McConnell chief of staff who remains close to the majority leader. "The White House has been pretty focused with the political plans for the president. From a Senate Republicans standpoint, we're elated by that." Republicans on both ends of Pennsylvania Avenue say that while the two pieces fit together — and there has been some coordination on both the Senate floor schedule and Trump's travel plans — the emerging strategy has been more a function of reacting to circumstances than a grand plan. Trump likes to campaign, and McConnell's been getting pressure from some of his GOP colleagues to keep Democrats occupied in Washington rather than giving them leave to talk to voters. A group of nearly one dozen senators last week wrote a letter to McConnell asking him to keep the Senate in session for some or all of August to work on nominations and appropriations bills. Sen. David Perdue, R-Ga., said that he has had multiple conversations with McConnell about it. "I think there's some receptivity to that," Perdue said. McConnell told reporters last Tuesday that he'd have an announcement about the recess in the "near future." 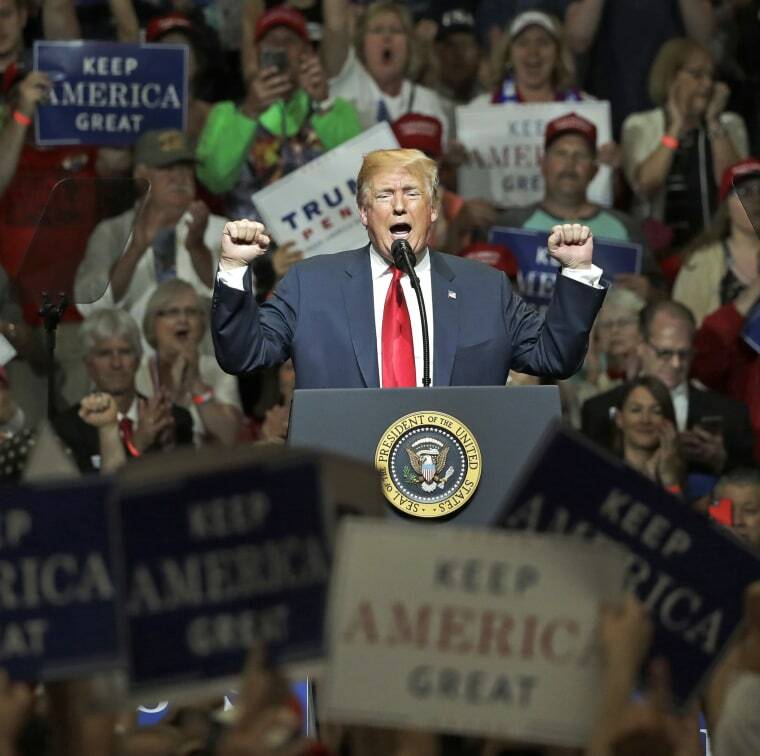 In recent weeks, Trump has visited Michigan and Indiana for campaign-style rallies under the auspices of his 2020 re-election bid. On Tuesday, he's scheduled to hit the stump in Tennessee, where Republican Marsha Blackburn is running for Senate. One GOP source says that he's been heavily focused on the midterms — voraciously absorbing data about the state of each race — after the embarrassments of party defeats in an Alabama Senate special election in December and a Pennsylvania House special election in March. The source said Trump is expected to make about one campaign trip a week from now until the midterms, and his vice president already has filled his own calendar with a combination of political rallies, fundraisers, and public events tied to a nonprofit policy arm of the Trump campaign apparatus. That said, sources around Trump acknowledge it isn't always easy to keep him focused. "How did our strategy to travel across the country and talk about infrastructure turn out?" one said. Earlier this month, Pence held a public event and a private fundraiser for Senate GOP nominees Mike Braun of Indiana, Josh Hawley of Missouri and Jim Renacci of Ohio in Indianapolis, one of a string of events he's hit as he barnstorms the country this spring. Amid reports of tension between their teams about the vice president's political activity — with some in the president's circle worried that the No. 2 was doing too much for himself — Trump's first campaign manager, Corey Lewandowski, joined Pence's political action committee as a senior adviser, where, according to PAC co-founder Marty Obst, he "focuses on providing guidance on key battleground midterm races, helping to ensure the president and vice president are maximizing their political travel, and assisting in early preparations for the 2020 re-election effort." Pence nodded to Lewandowski and Trump 2020 campaign manager Brad Parscale as "really special people" during his remarks to donors in Indiana earlier this month, and vowed that Republicans would buck the historical trend of the president's party losing seats in Congress in the midterm votes following his first election. "We threw out the playbook in 2016, and we're going to throw it out in 2018 when we expand our Republican majorities in the House and the Senate," he said, according to a person who was in the room. It appears that the one-two punch of Trump and Pence on the campaign trail with McConnell holding the Senate in session is a strategy that has developed from the various goals of top Republican players — and the reality that many more Democratic incumbents are defending seats than are their GOP counterparts. White House legislative affairs director Marc Short has discussed the Senate strategy with Trump's outside allies, according to sources who spoke to NBC News on the condition of anonymity because the conversations were private. Trump and McConnell have long been under friendly pressure from Senate experts to fill the Senate floor schedule because of the partisan imbalance in the number of Democratic and Republican incumbents who face re-election this year. Democrats are defending 26 of the 35 seats up in 2018, and Democratic Sens. Claire McCaskill of Missouri, Joe Donnelly of Indiana, Heidi Heitkamp of North Dakota, Bill Nelson of Florida and Joe Manchin of West Virginia are all in "tossup" races, according to prognosticators at the Cook Political Report. Sen. Dean Heller of Nevada is the only Republican incumbent on the ballot this year, while the party is trying to keep two open seats in its hands — those held by retiring Sens. Jeff Flake of Arizona and Bob Corker of Tennessee. Right now, Republicans hold a 51-49 majority in the Senate. If McConnell fills the summer and fall with votes on Trump's nominees, Republicans will end up with a more conservative judiciary, the ability to cast Democrats as obstructionists — a favorite talking point of Trump and Pence on the campaign trail — or both. And McConnell wants as many judges as possible confirmed in case the Republican midterm strategy falls short, with the GOP losing control of the Senate in November — and with it, the ability to push through nominations. Democratic leadership has downplayed the idea that a packed Senate calendar could leave lawmakers scrambling. "I think we're going to have plenty of time to get done what we need to be done if everyone cooperates," Schumer said. Others say a strategy that keeps Trump on the trail could be a knockout punch — for the opposition. "As a Democrat, this works for me," Jim Manley, a former Senate Democratic leadership aide, said of Trump's eagerness to campaign. "The more Trump is on the road, the better off my party will do in November." Manley said the benefits to the GOP will be limited and Democratic voters will be energized by seeing Trump on the political battlefield. "First of all there are only so many states and districts he can go to — because many Republicans don't want to have anything to do with him," he said. "Beyond that, I can only assume Republican strategists are betting that this is a good way to fire up the Republican base. But I have five bucks that says it will drive more Democrats to the polls than Republicans."